I came late to quilting, not actually starting my first one until 1993 when I needed something to do with all the fabric scraps left over from the clothes I made for my children and foster children. I had bins full of fabric way too cute to toss out. Although I came late to the game, my ancestors did not. Every one of my grandmother's beds was covered with a quilt she had made, either from her day dresses or from her children's clothes. Waste not want not, she always said. History is full of quilts used to tell a story. Stories of pioneers making their way across country in covered wagon, stories of slaves headed to freedom, their route told by signals sewed into quilt squares, and quilts that tell of family memories. These are my favorites. The ones where a mother can say, my child wore this on such and such day, or my grandmother received this one as a wedding gift. Pure treasures, every one. As a child, I played matchbox cars on a nine-block, pretending the blocks were houses and the rectangular pieces were the roads. Here is a picture of one of my most treasured possessions. A quilt made from my dear grandmother's day dresses. Faded and see through in some areas, I still won't part with it for nothing. Although my children are grown, and foster children moved on to other homes, I can look at this next quilt and tell you each child that wore the outfit and when. This last quilt is a quilt top given at some point to my maternal grandmother. It contains embroidered squares of relatives. One square simply says "Mama". My mother gave me this quilt hoping that I would someday put a backing on it. I intend to, but that day hasn't yet come. This is also the type of quilt depicted in the novella which released March 1. A story of four cousins who must come home to fulfill their dead grandmother's wish of reconciliation by finishing a family quilt. Do you have a quilt that tells a story? On the one-year anniversary of their grandmother’s death, four cousins from a fractured family converge on beautiful Colorado Springs to fulfill the terms of her will. They will piece together a quilt—and perhaps find a way to mend the hurt feelings and old feuds. Each young woman brings long-buried desires to the meeting. . .and each must face the calamities of the past—and the present. Can a torn and ragged family be stitched back together? 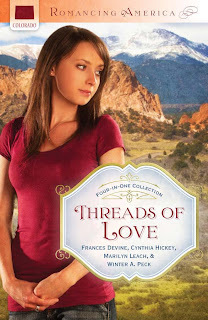 Leave a comment (and your email address) for a chance to win a copy of Threads and a $25 Amazon Gift Card. The winner will be chosen on the 6th. Multiple comments throughout the month enable you to also win these: Grand Prize- Kindle 2nd Place Prize- $25 Amazon gift card For each day you comment on CFHS you receive one entry in the kindle and $25 Amazon gift card giveaway. Comment on every post in the month of March and earn 31 entries! My quilts from my Grandma and Great Grandma are my most prized possessions. None of my aunts or Mother took up quilting and I really didn't want to see the family art die so I am now learning to quilt. I am in my mid-twenties and it was so much fun to talk with my Great Grandma (died last fall) who was in her early 90's about quilting and patterns, I get much of my quilting advice now from her daughter (my Grandma). We are blessed to have family quilts. One of my best quilts though is one I picked up at an flea market. My quilting sister and I brought it home and examined it. There was a hidden signature of a little girl, eleven years old and the date it was finished 1881. We knew immediately it was authentic. The seller knew he had a nice quilt but the price didn't reflect that detail. I was thrilled to have found such a rare bit of "inside the life." My husband's family were the quilters, so I've inherited a lot of the grandmother quilts. My family is the crocheters. Afghans don't tend to be as warm as quilts so I like to use the quilts though my hubby is almost appalled that I do. But hey, they didn't make them to be stuffed away in a box even if some are over 50 years old. When my first child was born, I got a baby quilt. It was a quilt top that was in a trunk in my grandmother's attic, that her mother had sewn. She was a dressmaker so the fabrics are really gorgeous! Anyway, so my grandmother and my mother finished it, then stiched along the edges all the names of the women who had made the quilt, and my name, and my daughter's name. Five generations in one quilt! It's called a 'flower garden' pattern and is so cheery! I love stories about quilts. Quilts are a fiber language about love and family and friends. I would love to win this one and read it. I only have one quilt which tells a story. It's a Sunflower quilt I made while my children were little for my sister. My sister was twenty one years older than me. The quilt pattern came from Mountain Mist. The sunflowers are appliqued on a white percale background. I can't imagine making such a big quilt again because now my place is much smaller. No where to spread it out and baste down the three layers. I am tweeting about the contest. I love quilts! Thanks for the opportunity to win the book & gift card! I love to quilt, and am always looking for new techniques. They are such beautiful pieces! I love quilts. I made one. For some reason I chose one of the hardest firsts I could do...a variation of Grandma's Flower Garden, which is handsewn. It took me 10 years!!!! Well actually, I worked really hard for a year, almost gave me carpal tunnel, put it away and didn't finish it until we decided to move and there was a particular someone I wanted to machine quilt it for me. I would try again, because I love the process, but I don't like sewing machines...lol....I keep thinking about it, though. My lovely mother in law is a great quilter! :) That's the exact project my Mum has been wanting to do ever since I was a child: turn all my lovely t-shirts into a memory quilt! I have a nice stash of shirts from my childhood/teen years, and at some point, when we live near a quilting store that is friendly to newbies, I know she's going to make it! :) I told her, I might have enough in the stash for two, actually! :) Laughs. Jorie, I must confess that I also made each of them just a tee shirt quilt. Well, 2 of them. The other two will get theirs this Christmas. I like to give them those to take to college. Memories of their days at home. When I was little my grandma used to make quilts. My sister and I had matching designs on our quilts. They were schoolhouses made from leftover material and grandpas shirts. I don't know where those quilts are now but I wish I still had them. I started a nine patch quilt in 1992 and never got it finished but now the blocks are long gone and I have no idea where they are, again I wish I would have finished it. I love to hear stories of quilts and they are some of the best blankets to have. Thank you for sharing and for the chance to win. I love quilts that tell a story. I have one planned, but haven't got past the original cutting stage. I hope I get to working on it soon! Thank you for sharing about your family quilts. I really love quilts. I have a quilt my grandmother made for me as a graduation present. Its made from fabrics she saved from my childhood. I love it and will never part with it. Hi Cynthia, quilts are a marvelous part of family life. When my niece and her husband were traveling a lot with their small children, I made them pillow quilts, using fabric to fit the kids passion at the time. I have a 1900 bullet bobbin (instead of the round one) treadle machine. I've made several quilt tops on it. My latest project is microwaveable bowl holders from fabric scraps. It makes getting hot bowls out of the microwave so much easier and safer. I look forward to reading Threads of Love. I have several quilts that my grandmother and great grandmother made. They are very special to me. I made a couple of small quilts when I was younger, but haven't attempted one lately. Instead, I collect quilted wall hangings and decorate my house with them. I have a beautiful 5' X 5' quilt with a floral bouquet in the center and a border of multi-colored maple leaves that hangs over my fireplace mantel. Quilts add so much color to a home. I am just learning to quilt. My Mom did alot of it, but she is quilting in heaven now, I expect :). I have sewn many patchwork aprons, an am now progressing to table runners and hope to do wall hangings as well. I am not a sewer, so it is ironic that I ended up with my Grandmother's patchwork quilt. She used all of the leftover fabric from dresses she made for herself and for my mother--waste not, want not. She utilized every last scrap and created a very unique and lovely piece of art that I have hanging in my upstairs hallway. It goes so great with my old farmhouse. Hi Cynthia, Your story brought back the memories of my family quilts, too. I have a torn and tattered quilt left to me from my great-grandmother. She used the clothing leftover scraps to piece it & there's one particular square with candy lollipops material that she used from one of my early childhood dresses. Thanks for writing a great little story about quilts! This sounds like a wonderful book. Thanks for having the giveaway. The quilting ladies from our church made a quilt for my parents when they first came to the church and each one of my siblings and I received a quilt when we graduated from high school. Each patch was made by a different woman. Cynthia, my mother has one in her closet that needs finished. There is one strip missing. I think she's been waiting for the right color. I believe it is a Holly Hobby quilt. I think my great, great grandmother made it, but I can't remember. One weekend in August, my mom and her sisters got together and made a quilt from my grandma, using a Sudoku pattern. One block for each of the siblings and their parents. It was nice for them to get together, much like your book. I'm wanting to make my children prayer quilts. I started one many years ago by embroidering scripture on blocks. I hope to finish it. I love quilting. I try to read everything quilt related whether fiction or non fiction. I have been unable to quilt for last 2 1/2 yrs due to a brain injury, have to relearn to quilt again. Someone told me years ago that quilts hold so much history including tears and comfort. I have a quilt that a wonderful lady made my son when he was born. I am saving it and hopefully he will use it with his own child. My dream is to one day buy an amish quilt in Lancaster, Penn. They are such a labor of love and so beautiful. The stories within your quilts are precious! I have never made a quilt but have friends who do. Thanks for this wonderful give-a-way! My Mother made me a quilt of a big butterfly in every square that had wings made of material she had made my dresses from and embroidery too. I still have it. I like the stories that are told about the different ladies groups that solved their personal problems with thread and a needle. I enjoyed seeing your quilts. I have one on my bed that my mother and sisters made for me years ago. It's the type of quilt that was made of our clothing scraps so holds a lot of memories. It's getting quite worn but I will keep it. I also have baby quilts that both my grandmothers made for me, and a large size signature quilt that my grandmother and her quilting club made in the mid-1950s. All those women are gone now, but I remember many of them from my childhood. It is wonderful to have these tangible memories. Im late but wanted to comment I dont have a quilt yet but this year when I go on a trip to America I may buy pieces to put in a memory quilt. Mum had one a friend made her when when she was in the nursing home and she loved it. The centre panel was a peaceful panel and lovely strips around it including some of my own material. She machine quilted it and put a bible verse on it. if an aussie can enter (I think we can for gift cards) my addy is ausjenny at gmail dot com. Wow! I am so humbled by all the comments. So pleased to hear others love quilts as much as I do. I have a quilt that my grandparents bought for me from the Amish. It does not have a story as far as I know but it is pretty. Quilts are an important part in my family! I have one of my grandmother's old quilts. Before my grandmother died a few years ago, she made a quilt for each one of her great granchildren. They are certainly a labor of love. My email is cyndew@rocketmail.com. I'm a quilter and have been following this series. I have several quilts that tell stories. One particular quilt that is very dear to me is one that I purchased in Shipshewana, Indiana shortly after my mother passed away. My husband encouraged me to buy a special Amish quilt in memory of my mom, and every time I look at that quilt I'm reminded of the wonderful life I shared with my dear mother and best friend. I miss her still and it's been over 25 years since I lost her. I love the books, and would love to be entered in this contest. Thank you for featuring it today! Quilting is one old world craft that I want to get into next, as I have already begun my journey into knitting! :) Knitting was a bit easier to pick up, as we found a few local yarn shoppes that were encouraging newcomers to pick up the needles! I wish I could say the same with local quilt shoppes! :/ For now, I am enjoying the art of quilting through the Elm Creek series by Jennifer Chiaverini!? Have you picked up one of her books, yet? Being that your a quilter yourself, I think you'd enjoy reading about the ladies that make up the Elm Creek Circle of Quilters! The stories dip into the historical rich past, and even trace their genealogical roots! How to follow the series is a bit unique, as the author shifts focus! Be sure to read her FAQ if want a guide ahead of time! Laughs. The quilts in my family were found at an auction, but my great-grandmother was into rug hooking and crochet. We have a few pieces that she made and I cherish them as much as if we had a quilt! Your quite right in how each quilt is individualistically a woven story,...I have read about 'hidden' messages, either with patterns of the squares OR with stitches! I was curious how you were going to finish the quilt that your mother gave to you!? Are you going to stitch in a hidden message for the next generations!? I thought it was such a blessing that you have the children's quilt that represents yours and the fosters who came through your home! I want to adopt through foster care in the future, and so, I found this especially touching! Quilts help our hearts remember inasmuch as photographs! I would love to read your story in Threads of Love! When we were leaving to become full time missionaries to Central America, I gave all my 4-H shirts to a family (I was a county 4-H agent) who SURPRISED me by making a quilt with the front sides of the shirts! I thought they were going to wear them. What a blessing to take my memories with me! When I was a home economics teacher I would let the Senior's work on a Crayola quilt in between missing class for the Sr. graduation activities. Have you heard of a Crayola quilt? I love quilts! My mother in law makes them and I'm hoping to learn and teach it to my daughters. I have only now developed an interest in quilts, only from reading all those amish books. I'm not much on sewing but it looks like fun. Wonderful post! Love the quilt made from grandma's day dresses. I have no idea what to do with needle and thread let alone quilt! Fabulous talent. Jasmine A is the winner of the signed book and Amazon gift card! Yay! Jasmin! Nice!!! I sent an email in return, did it arrive? I am having a little trouble with cyberspace stealing my sent emails. Aww man, I thought the winner was going to be picked on the 6th. Oh well. This book looks GREAT!! I miss CO Springs... I lived near there for 10yrs. Miss it. I don't have a quilt story. The only quilt I own was store-purchased and given to my husband and me for our wedding. I love that thing! I quilt, but haven't made many. So excited to have found this site and can't wait to check it out! I so enjoyed your post! I quilt and find it very relaxing. I like scrappy star blocks and creating borders with different shapes/angles. Ladies come from surrounding communities and have been meeting about seven years. We machine quilt together on Tuesdays. My first quilt was for our California King guest bed. During this time we were having our home remodeled so I didn't sew at home because of the carpentry dust. When I finished, our quilting group had a lunch to celebrate. Other ladies share their scraps with me and it was fun to have them say which pieces were theirs in my quilt. I don't have any quilts that tell a story, but I helped to make one that has become a special memory for someone else. When my son was in first grade (10 years ago), his teacher became pregnant and so it was going to be her last year of teaching. Another lady and I got together and came up with the idea for a quilt. We had each child write on a square and paint their handprint on it. Then I took a picture of the entire class and did an iron-on transfer of it to the center block of the quilt. We did this all on a day when the teacher was at a doctor appointment, so when we presented it to her, it was a total surprise! It is a treasured possession to her today, and something that I hope will always bring fond memories. I have several quilts. The first one my maternal grandma made for me. It is awesome to look at the fabric and remember dresses that were made out of the fabric for family members. I also have a crazy quilt that was given to me as a wedding gift by one of my co-workers. Her best friend's mother made it as a wedding gift for her daughter. But before she was married she passed away suddenly. The quilt was then given to my co-worker with instructions that it was to be given away to someone in love before their wedding day. She chose me. I was so blessed then and continue to be blessed now. I love quilting... It brings back memories of quilting with my grandma!